Side dishes, lunches, and easy meals to prep ahead: these are three of the biggest requests I've gotten lately, and they are three things I am always searching for new ideas for myself! Oh, and one other thing: recipes that won't heat up the house with a stovetop or oven cranked on when it's summertime. Another big request. So what if you could find all of that in one dish!? 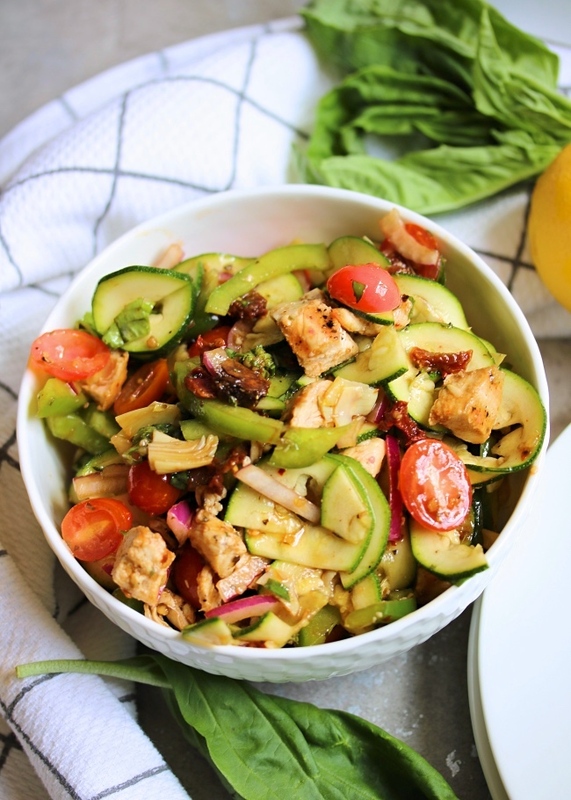 That's THIS: my new Whole30, Paleo twist on a classic pasta salad with the easiest Italian dressing. 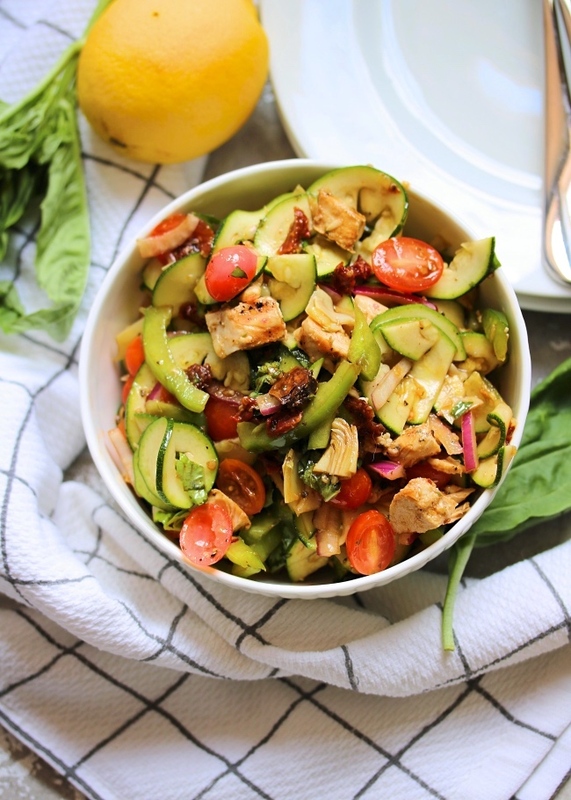 Veggie-packed dishes are my favorite, and are so perfect for lunch time! Green salads are always a great option, but can get boring just like anything else that you've eaten too much of for too long. 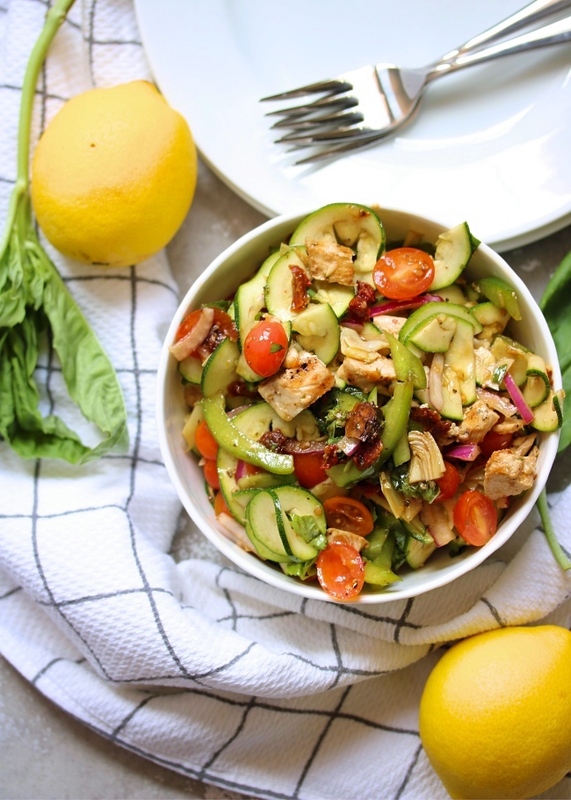 This dish has tons of different textures, SO much tangy fresh flavor, and is sure to get you out of a salad rut. 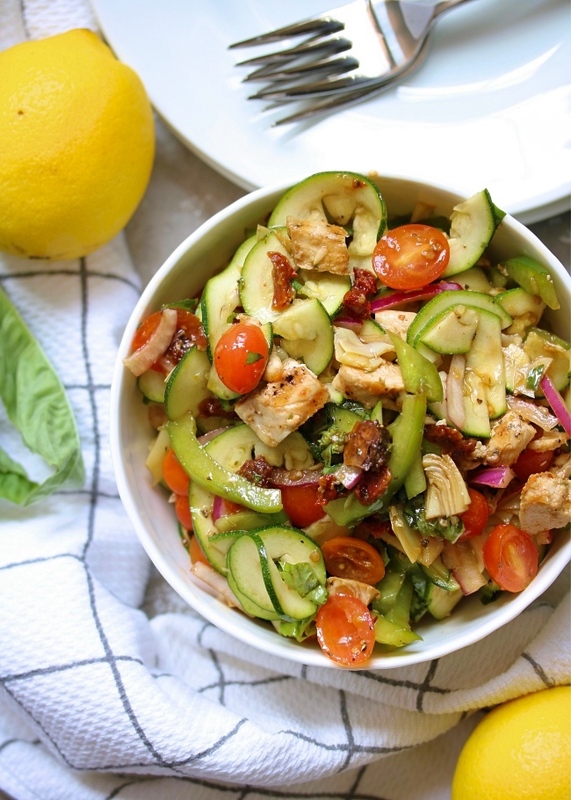 Add some chopped grilled chicken and some healthy fats, and you've got a complete meal. I brought this along for our family's Father's Day BBQ, and it was a big hit! You could leave out the chicken if you're serving this as a side, but we never say no to added protein- so I kept it in! It made the perfect leftovers for lunches the next day for both my brother and my husband. Easy to eat on its own, or topped with additional protein. And did I mention how flavorful it is? Those rich, fresh flavors of sun dried tomatoes, garlic, and basil merry together overnight while it sits in the fridge and make for the most delicious leftovers ever! I hope you guys enjoy this as much as we do! I'll be in the kitchen, making a bit ol' batch of this for a week's lunch prep. Meanwhile, don't forget to take a picture & tag me on Instagram if you make this too! Trim the ends off of the zucchini. Use a vegetable spiralizer to create wide, ribbon-shaped noodles. (I use Blade "A" on the Inspiralizer.) Roughly chop the ribbons into bite-sized pieces. In the bottom of a large mixing bowl, combine the Italian Dressing ingredients. 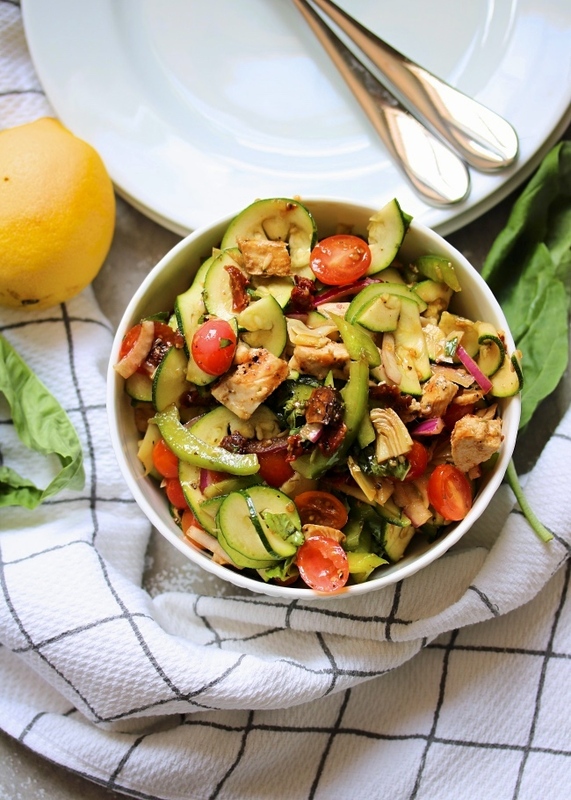 Add all of the ingredients (chopped chicken, vegetables, basil, and sun dried tomatoes) to the bowl, and toss to combine. Serve chilled. Feel free to make this up to one day ahead, and store it in the refrigerator until you're ready to enjoy! If you are making this on a Whole30 & cannot find compliant marinated artichoke hearts, you can use a non-marinated variety as well! I just like the extra flavor this adds. For an Italian herb blend, I love the one Kouzini makes, found on Amazon. Primal Palate also has wonderful blends! Whichever Italian herb variety is your favorite will be great in this dish. I'm having a hard time thinking of an Italian dish that I enjoy more than a stack of home-made lasagne. Thanks I got into your blog.